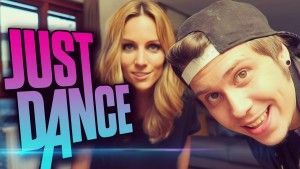 “El Rubius” which is probably the most popular youtuber of Spain and certainly one of the most recognized in Latin America; shared few tweets with the famous Spanish singer Edurne. In those Tweets both challenged each other in a nice way to carry out a duel on Just Dance 2016 (a funny dance game created for the Xbox 360 and One, Playstation 3 and 4, Wii and Wii U platforms). After they challenged each other in social networks, they decided to carry out the challenge like an advertisement of the new game of Ubisoft. To do so they contacted our company Tao Plus Locations with the mission to find and manage a cozy, homey space where the protagonists of video were comfortable as in their own homes. The result? Well, as one would expect with two such eccentric personalities from the art world, the result was so funny as expected… but, check it out by yourself! Click on the following photo.